Firstly I’d just like to wish everyone a Happy New Year and I hope your hangovers aren’t too bad. 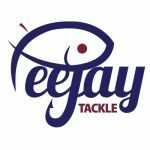 Before I get onto the days fishing, I just wanted to say a massive thanks for all your support as the blog continues to go from strength to strength and is breaking new ground all the time. December saw the blog exceed 20,000 (24,071 to be precise) hits in a month for the first time and on Thursday 29th it passed 2000 (2292) hits in a day, awesome stuff, and as long as the blog keeps going in the right direction and you lot enjoy reading it, I’ll keep writing it! Quite a few of us met for breakfast at the Little Chef again (and it was great to see Leighton and Harry who hadn’t fished with us for a while), and I can’t fault it (apart from the price obviously), service was quick and the food was good, just the job. We then headed to Upper Coxes to meet the others. 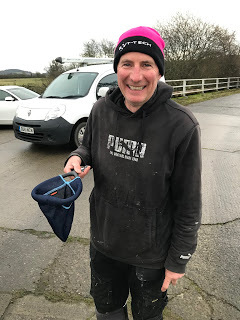 While we waited for the draw, Hurf showed us his new landing net that his wife bought him for Xmas and she obviously doesn’t take any notice of his fisherman’s tales! Well they say size doesn’t matter! Rob had put all good pegs in and I really didn’t mind where I drew although I did say to a couple of people in the week that I’d like a crack at 106 or 109, both really good chub pegs. The draw was announced and by the time I got to draw there were only a few balls left (so my New Year’s Resolution of getting in there early was broken already! ), Harry pulled out 129 at Isle Brewers which just left two pegs with me and Leighton left. I grabbed both and invited him to choose which hand, he went with my left which turned out to be H4, a great peg that’s won the last two matches, I opened my other hand and 106 was staring back at me, that’ll do! After the recent cold spell and a few frosts, it was a lovely mild day and I really thought we’d be in for a good day, as I walked up to my swim, something moved in the peg and first of all I thought it was a good fish but then there were more ripples by the far bank but I didn’t see the culprit so otter, moorhen or something else? 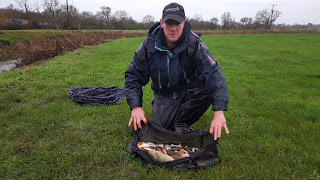 I got my box level and looking at the peg I have to say I really fancied it, Fieldy had three chub for 6lb odd in the last match and had lost/bumped several and Justin had over 16lb of chub and roach in the match before that. I set up a 1.5 gram Drennan Carbo with 0.10mm bottom and size 18 Kamasan B611, the hooklength was on the light side but it was a bit of a compromise as the swim didn’t look too snaggy and I was hoping some roach might show along with the chub. 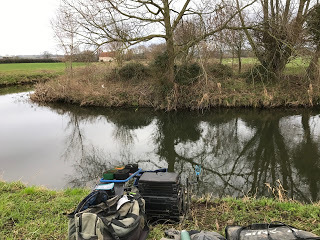 There wasn’t much difference in the depth so I would start down the middle at 10 metres while feeding across by the tree at 11.5 and 13 metres and go over later where the chub would hopefully be queued up. The start time of 10:30 soon arrived and I began with single caster on the hook, I really thought I’d catch quite quickly but after half an hour with no indications I stuck another section on and went further over a lot sooner than I was expecting too! 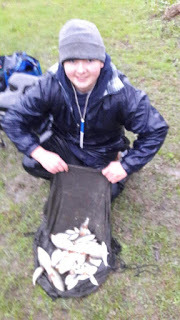 Still nothing, so I tried single maggot just to see if I could get a bite, I did have a couple of very tentative knocks down the middle but they didn’t really develop and I put it down to minnows. After about an hour and a quarter, I was still blanking but I wasn’t too worried because like I’d said to Adie on 108, it only takes and hour to win a match on these chub pegs. Then the wind got up and it started raining and from being a very pleasant morning, all of a sudden it was horrible and freezing cold. I put my coat on, poured a cup of coffee and prepared to batten down the hatches. Another hour or so passed and I still hadn’t caught and then Rob walked up from below the bridge and said it was the same there, he’d caught a minnow and Adie had three minnows! He did say he’d spoken to Leighton who had some nice perch at Hambridge and I’d had a one in two chance of drawing that peg this morning! He left me to it and I went back to single maggot down the middle to see if I could get a minnow and eventually I had a bite and thought I’d missed it but then swung in a tiny stickleback! I kept swapping between the two lines and apart from another stickleback it just wasn’t happening and I was pinning all my hopes on the last hour as the light faded. 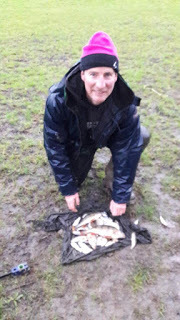 My hands were so cold they were like claws and I was struggling to put bait on the hook, my eyes were watering, my nose was running and all I could think about was being sat in the car with the heater on! 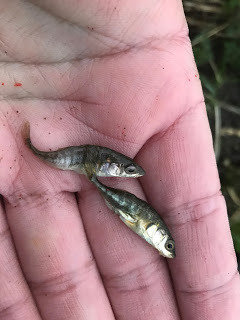 I’d like to report that as the last hour arrived, the float went under and I bagged up but I won’t drag this out anymore than I need to and I finished up with just the two sticklebacks. I packed up as quickly as my numb hands would allow before taking my kit back to the car, it was a similar story below the bridge as Rob had one minnow and Adie had bagged up with six minnows and a stickleback, he did actually go back to the car at one point to warm up and I wish I had now. 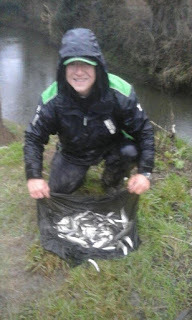 My ‘haul’ after five hours in the freezing rain! So after a really nice match to end 2016, an absolutely abysmal one to start the new year, I hope it’s not an indicator of how 2017 is going to go! Sitting here now in the warm typing this, I’ve forgotten how cold I was earlier, hopefully it’ll be warmer next week. At the moment, Hambridge certainly seems to be the place to draw and I came close this morning! 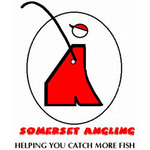 The way my lucks going I’ll probably be there next week and the chub will go crazy at Redbridge! The league positions after six matches and dropping the two worst results are as follows, I think there’s still four more rounds to go so it’s all still really tight. At this time of year mate you are either on them or your not, looks like your still well in with a shout. Happy New Year.